For over 25 years Bright Beginnings has offered an uncommon level of education and development for young children. It has consistently received rave reviews from thousands of parents when asked to evaluate the Center. It continues to set the pace and has become a model for all other public and private centers in the area. 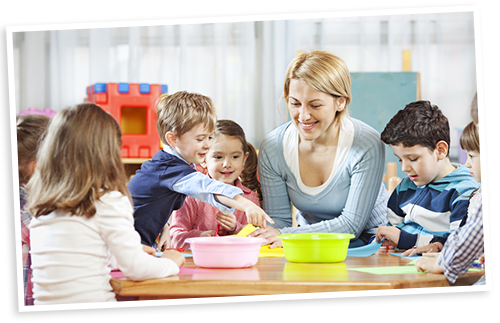 Our primary goal is providing families with quality childcare in a warm, safe happy environment – a place where you can leave your child, confident that he or she is receiving outstanding care and enjoying a positive, stimulating learning experience. Children learn by doing. A child learns best when the abstract world becomes real through well-designed activities involving all five senses. In planning our program, we consider the whole child, not only one aspect of development. Security has never been a problem for us at NF Bright Beginnings. Nonetheless, taking a proactive stand for the safety of all, we have installed a new state-of-the-art security system at our facility that allows us to monitor all classroom entrances and exits and the playground from the center office. Meet the Family of Professionals!We take great pride in our professional staff with their qualifications, credentials and their ability to work together to maintain a safe, nurturing and productive environment for your child. © 2016 New Fairfield Bright Beginnings. All Rights Reserved.